In the southern region of the Philippines is the island of Cebu—the oldest city in the country. This is the island where Ferdinand Magellan landed in 1521, hence the discovery of the Philippines. Cebu has so much to offer, like the Olango Wildlife Sanctuary. Located two miles off Mactan Island is another island called Olango. 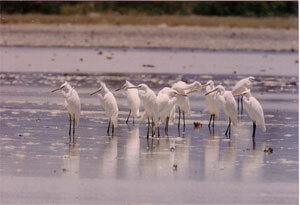 With over 10,000 migratory birds, Olango has the largest concentration of migrating birds in the Philippines. They flew to the country from as far as Northern China, Siberia and Japan. In the south shore of the island is where the Olango Wildlife Sanctuary is located. There are 97 bird species and 54 water-bird species. Out of the 97 species, 48 are migratory. The best time to go to the Sanctuary is when the tide is low. You’ll see the birds looking for foods in the flats. To avoid getting a cut from sharp corals and other things, make sure to watch your steps when walking around the area. Wearing tennis shoes is highly recommended. This is an internationally protected area, so be sure to help keep the habitat clean and eco-friendly. All bird enthusiasts will have a field day here. Happy bird watching!